Lt Howard had no regularly assigned crew on his four missions as 1st Pilot: 236 (5 Sept 1944), 237, 245 and 248 (28 Sept 1944). He had different crewmen on three of these missions. The B-17 was hit by 20mm shells after severe and intense fighter attacks. Two of the projectiles exploded in the waist. 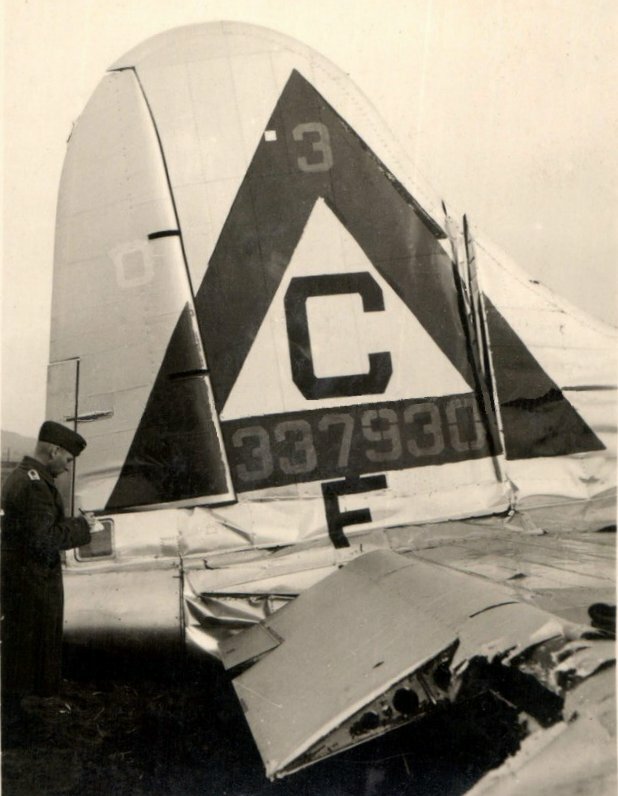 Parts of the B-17 were seen to come off. The left wing was on fire. When last seen it was going down in a spin 20,000 feet below the formation. Four parachutes were seen coming from the waist just after it started down. All opened right away. The Fortress crashed near Ohrum S/Wolfenbuttel. [MACR 9406]. Sgt Claude McGraw (E) related the following: "I was informed by the Germans that Sgt Sheppard Kerman (R) had died. I saw his personal effects at Brunswick, Germany and inquired to his whereabouts. Knowing that he was conscious and not too badly wounded when he bailed out I suspected that he may have been murdered. Lt Jack L. Timmins (B), who was pushed out of the stricken B-17 by Sgt Sheppard Kerman, was advised by German soldiers that Sgt Kerman "bled to death." In fact, he was murdered by German officers. Much more information on the murder of Sgt Kerman is here. For mission #248 crew photos and additional mission information see: 2Lt Victor L. Howard (P) - William M. Wilson crew page. All other crewmen - Aloysius I. Sapak crew page. (No photo of Sgt Sheppard Kerman (R) who was a replacement on the original crew). Lt Sapak crewmen were on their first mission except for Lt Sapak, Sgt's Baker and Stewart, who also flew on mission #247 with other Pilots.